On my most recent cross country flight I tested out the CloudAhoy app to track and store flight data including route of flight, altitude and speed for the entire flight. 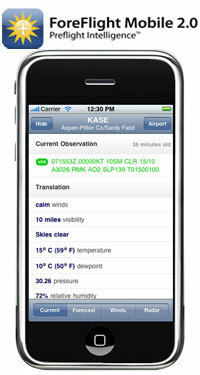 CloudAhoy is a free app for the iPhone and iPad that lets you keep a visual record of each flight. For whatever reason I have always enjoyed the idea of documenting flights. The process of tracking and creating a visual representation of a flight used to be much more intense, so much so that I think few people did it. 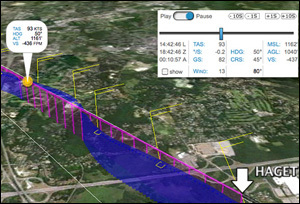 For me it required bringing along a GPS Data Logger then somewhat manually merging that data with a Google Earth to create a map of my flight including speed and altitude information (see such a flight). The process was kind of messy and time consuming. I was pleasantly surprised with how well CloudAhoy accomplished this task. Before my last cross country I downloaded the app and signed up for a free account. Prior to take off I signed into the app and then entered the aircraft tail Number, my name as the pilot and clicked "Start". Simple as that. When I landed in St. Louis and came to a complete stop it automatically stopped, which is a nice feature as I would never remember to stop it on my own. 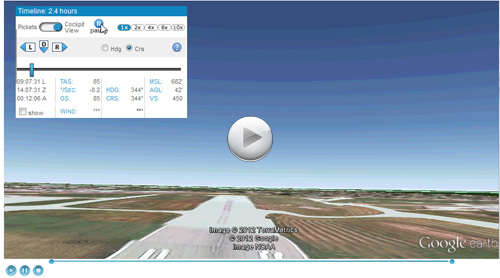 After a flight you can debrief on an iPad or on the CloudAhoy website. From there you can see your flight track from various views. 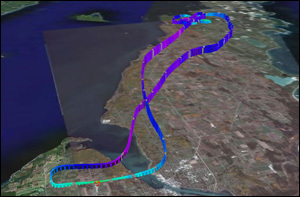 Overhead gives a good view of the path of flight, from the side or at an angle provides great information on altitude. But, the most fun view is "Cockpit" view where it shows you what the view would look like based on a Google Earth image. You can view my public debrief of this flight here. I saved out a flash video where you can view my takeoff from Chicago Executive from Cockpit View. I should note I manually added in the LiveATC communications from that flight. I reached out to Chuck Shavit, creator of the app to learn more about what his goals were for this app. Chuck has been a certificated pilot for more than five years and holds and instrument rating and is working on a commercial license. He basically developed the prototype for this app while he was pursuing his Instrument Rating as a way to debrief after each training lesson. In fact I think that is one of the most valuable features of this tool is to be able to merge data from your actual Instrument Approach with the published approach to see how you did (as shown to the right). I believe this product could be extremely beneficial for private pilot students too to track their cross countries and to track maneuvers like turns around a point and then review with their instructor. 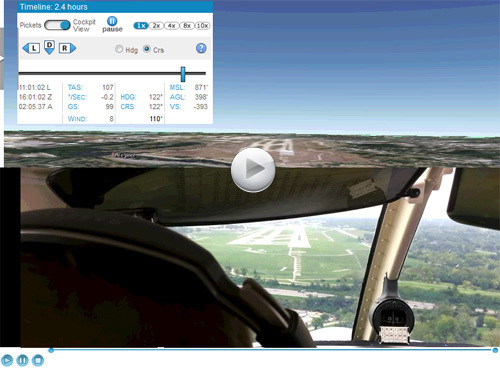 Check out this video of an ILS Approach via Cockpit view. Chuck mentions he tracks ever flight but does not necessarily with the intention to debrief each flight. He mentions that you never know when that flight might occur that you would wish you had this data. For him it was a year ago on an IFR flight in an Arrow with no auto pilot. He lost electric power and went NORDO while in Class B over Boston and continued to his destination. He debriefed after the flight and looked at how he handled the plan while working to restore power. He mentioned it was a reminder why pilots are taught to Aviate first. I expected this app to be a battery hog, but it was not. It is also important to point out you can use this app in conjunction with other apps like ForeFlight, it just continues to run in the background then stops tracking when you land. I had video from my landing at my destination from this flight. Below I have merged a small snippet of the CloudAhoy Cockpit view with actual video from an iPhone of that landing.. I was not able to sync them up perfectly or add in LiveATC but you will get the picture. This sure makes for a fun way to keep enhance a memory from a flight. Download CloudAhoy and give it a try on your next flight!